La Jolla Shores in San Diego is a sought-after community and a favorite beach for kayakers, swimmers and snorkelers. 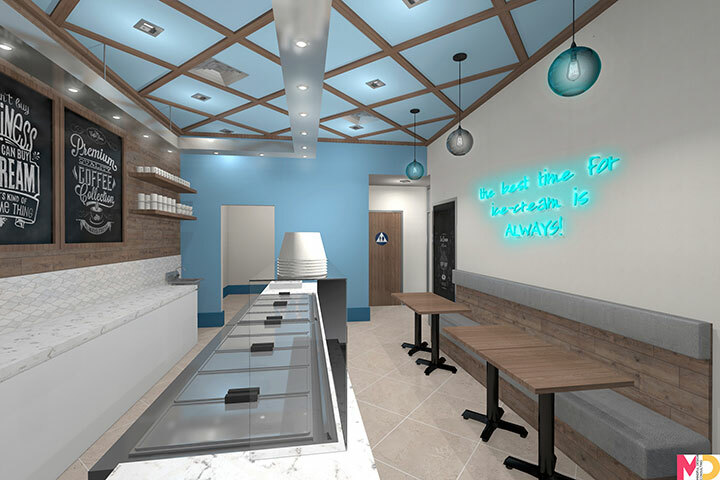 With the ocean on one side and a neighborhood with ocean-view villas, charming cottages and a shopping district with a small town vibe on the other, La Jolla offered us more than enough inspiration to create the interior design of the local Scoops Ice Cream store. Offering popular desserts such as ice cream and crepes, the shop is a favorite stop for a quick treat and for a well-deserved break before the next beach adventure. 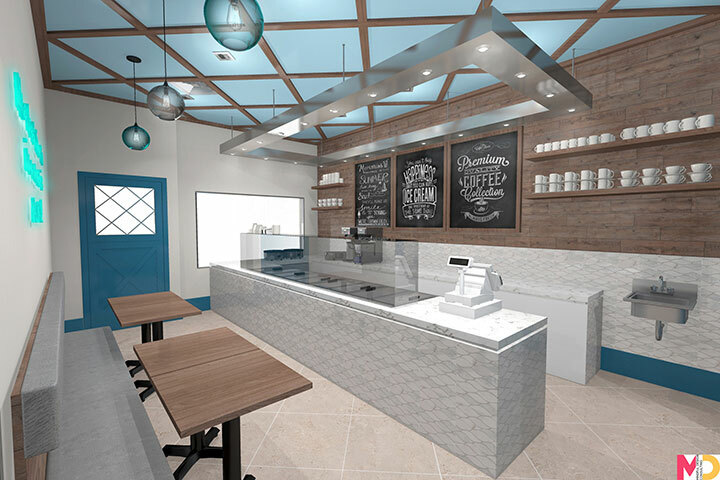 The owners wanted Scoops Ice Cream to become a local hang-out place, both laid back and inviting, and resonating with the beautiful location. 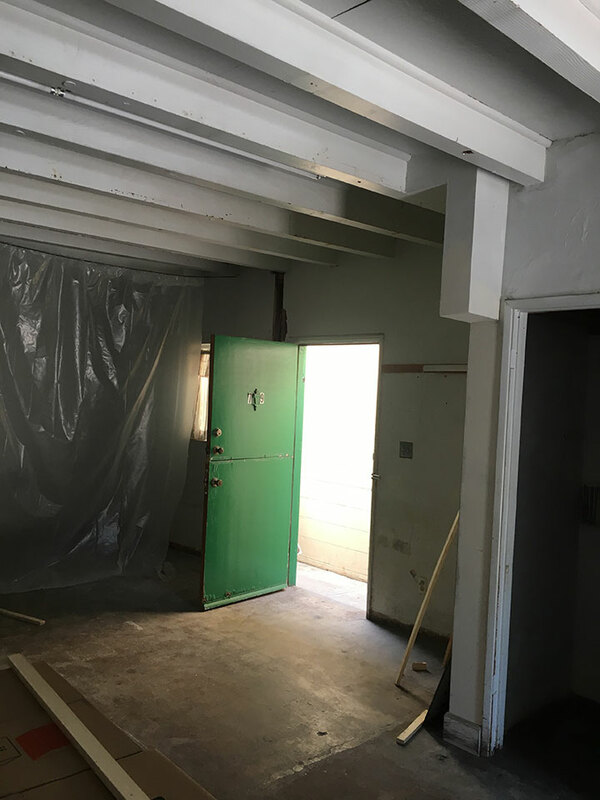 We started with a blank slate, but a clear vision. We decided early on to use a combination of blue and earthy colors that reflected the beauty of the beach and the hues of the ocean. Blue was an inspired choice not only as a way to capture the beauty of the waves, but also as a cold, refreshing color, perfect for a place meant to re-energize its patrons for their next activity. The two tones of blue reflected the different nuances of the ocean and the sky. We paired these hues with earthy tones that we incorporated into the wooden tables, bench base and the wood-planked wall behind the counter. The porcelain floor has the color of the sand on the beach, recreating the chromatic combination of the oceanfront. Keeping with the idea of reflecting the natural beauty of the location, we made heavy use of natural materials. Aside from wood and tile, marble countertops offer a refreshing light contrast to the deep blue and dense brown of the interior. The grey benches remain in the same neutral zone, yet bring one more color into the mix, for more chromatic variation. The oceanfront, with its water-and-sand simple and inspiring duo, almost demanded that we keep the design light and uncomplicated. However, we created a geometric pattern on the ceiling to tie in the colors of the space, to create some visual drama and to give the space character. 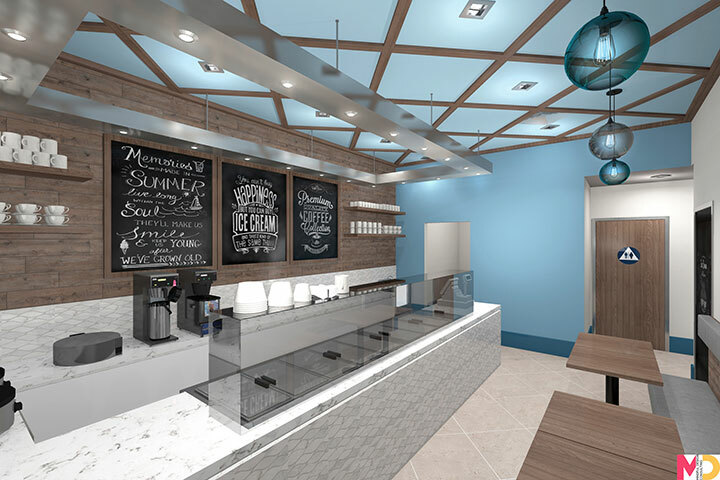 Simple pendants that filter light through blue glass globes soften the sharp angles of the large rectangular multi-light pendant above the counter, but both have a simple charm and a modern vibe with industrial undertones. The presence of wood gives the interior a light rustic touch that makes the space warm and inviting. Balanced by the industrial accents of the tables and light fixtures, these rustic details are adapted to contemporary tastes. This combination of contrasting warm and cold tones, and of rustic and industrial accents are a perfect image of the ocean – old yet always new; cold, yet ready to create warm memories.